Cookie dough can be frozen in an airtight container for up to 9 months. Thaw just until soft enough to handle. To freeze refrigerator cookie dough, wrap rolls of dough in aluminum foil or freezerproof wrap. In a dry climate, keep cookies crisp by storing them in a loosely covered container, such as a cookie jar without a snug lid. In a damp, humid climate, store in a tightly covered container. Allow frosted or decorated cookies to harden or become set before storing. Store them between layers of waxed paper, plastic wrap or aluminum foil. If cookies soften, heat them on a cookie sheet at 300ºF for 3 to 5 minutes to recrisp. To keep cookies longer, wrap tightly, label and freeze up to 6 months. Do not mix crisp and chewy or soft cookies together in the same container; the crisp cookies will become soft. Most brownies and bars can be stored tightly covered at room temperature, but check the recipe to be sure. Some may need to be stored loosely covered or in the refrigerator. Meringue, custard-filled or cream-filled cookies don't freeze well; the meringues become tough and the fillings become watery. Cookie sheets should be a least 2 inches smaller than the inside of your oven to allow the heat to circulate around the cookie sheets. Square pans--and smaller rectangular pans--come in several sizes and can make choosing a bake time confusing. Measure pans carefully for size, and use the bake time for the closest pan size. And always follow the doneness test for the recipe or mix. Bars baked in pans that are too big can become hard and overcooked. Grease cookie sheets and baking pans only if a recipe specifies to. When greasing cookie sheets, use shortening or cooking spray. Regrease cookie sheets if cookies begin to stick during baking. We don't recommend using butter, margarine or vegetable oil for greasing. The area between the cookies will burn during baking and will be almost impossible to clean. Don't grease nonstick cookie sheets even if a recipe calls for greasing; the cookies may spread too much. But do grease nonstick pans when baking brownies. Cooking parchment paper can replace greasing. It's found in grocery stores near the aluminum foil or in the baking ingredient aisle. When using parchment paper, just tear off the length of paper you need to cover your cookie sheet and place it curled side down on the cookie sheet. In a hurry? Just slide the baked cookies along with the parchment paper off the cookie sheet onto the cooling rack. In no time, you'll have a cooled cookie sheet ready for the next batch. Have more baking to do than pans? Line baking pans with aluminum foil for super-quick cleanup and to help cut brownies and bars evenly. When the brownies are cool or nearly cool, just lift them out of the pan, peel back the foil and cut. Your baking pan will be free for the next batch. To prevent sticking, dust the rolling surface and rolling pin with flour, or you can use powdered sugar. A pastry cloth helps prevent sticking, too. Or you can roll dough between 2 pieces of waxed paper or cooking parchment paper. Roll only part of the chilled dough at a time, keeping the remaining dough refrigerated. Cut cookies with a cutter dipped into flour or powdered sugar-baking cocoa for chocolate doughs--as close together as possible on rolled dough to avoid re-rolling (re-rolled dough will be a little tougher). Lift cookies to a cookie sheet with a wide metal spatula that's at least as wide as the cookie so the cookie doesn't lose its shape. Nothing's more delicious than warm-from-the-oven, all-American chocolate chip cookies! A few reminders to make yours perfect! You may want to use an electric mixer to mix the sugars, fats and liquids together. Air incorporated into the fat acts like a leavening. Then just stir in the dry ingredients by hand. Too much mixing, especially if you have a heavy-duty electric mixer, will make cookies tough. Use 2 tableware spoons to drop dough onto a cookie sheet. Scoop dough with 1 spoon, then push onto cookie sheet with the other spoon. Getting a package of cookies--or quick breads--can make the day for a hardworking college student, out-of-town grandparents or busy young family. Give it a try with these easy tips. Choose sturdy, unfrosted cookies and bars for mailing. Drop cookies and other hearty cookies in simple shapes are almost always good travelers, too. Wrap cookies in pairs--back to back--and place them flat or end to end in a can, box or other durable container. Fill each container as full as practical, padding the top with crushed waxed paper to prevent shaking and breaking. 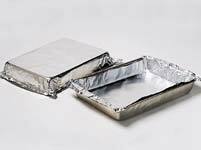 Bake and send bars in disposable aluminum foil pans, enclosing a plastic knife for cutting. Pack containers in a sturdy packing box (line it with aluminum foil if you want to be sure packing materials and cookies don't pick up moisture or odors while in the mail). For fill, use crumbled newspapers, shredded paper or shredded polyethylene foam. Be sure to pack several inches of fill in the bottom of the packing box and between items so the cookies cannot move easily. Seal and label the package "Perishable" to encourage careful handling. Use the pan size called for in a recipe. Brownies made in a too-large pan will be overbaked; those in a too-small pan will be underbaked. No choice about the pans you use? If it's larger than called for, use a shorter bake time. If it's smaller than called for, use a longer bake time and reduce the oven temperature 25°F. For easier cutting, cool brownies and bars completely and use a plastic knife or table knife. Lemon Bars can be made a day ahead and refrigerated before cutting--they even have better flavor when chilled! You can moisten the knife if Lemon Bars tear. Shiny aluminum or gray, nonstick-coated metal pans are preferred for baking bars. Because heat is reflected, these pans prevent the crust from getting too brown and hard. Bars baked in pans that are too small can be doughy in the center and hard on the edges. In a hurry? Just slide the baked cookies along with the parchment paper off the cookie sheet onto the cooling rack. In no time, you'll have a cooled cookie sheet ready for the next batch. Have more baking to do than pans? Line baking pans with aluminum foil for super-quick cleanup and to help cut brownies and bars evenly. When the brownies are cool or nearly cool, just lift them out of the pan, peel back the foil and cut. Your baking pan will be free for the next batch. Heat your oven. This usually takes about 10 minutes. Bake brownies and bars in the size of pan called for in a recipe. Bars baked in a pan that is too large will overbake and be hard. Bars baked in a pan that is too small can be doughy in the center and hard on the edges. There's more to cake success than mixing the batter. You also need to bake cakes with care. Use the size of pan called for in a recipe or on the package of mix. How do you know the size of a pan? Measure across the top from inside rim to inside rim; then place the ruler inside the pan to measure the depth. If the pan's too big, your cake will be flat and dry; too small and it'll bulge or overflow the pan. Shiny aluminum or gray, nonstick-coated metal pans are the first choice for baking cakes. They reflect heat away from the cake for a tender, light brown crust. 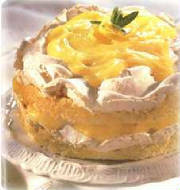 Refrigerate cakes with custard or whipped cream fillings or toppings (this type of cake does not freeze well). 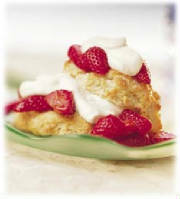 Loosely cover frosted cakes and store up to 2 days at room temperature, or tightly cover and refrigerate up to 1 week. Cool unfrosted cakes completely before covering and storing to keep the top from becoming sticky. Serve a cake with fluffy frosting the same day you make it. Put cakes containing very moist ingredients, such as apples, bananas, carrots, pumpkin or zucchini in the fridge during humid weather or in humid climates. If stored at room temp, these cakes tend to mold quickly. When making ahead or when freezing leftovers, tightly cover unfrosted or frosted cake and freeze for up to 2 months. Loosen wrap on frozen unfrosted cakes, and thaw at room temperature 2 to 3 hours. Loosen wrap on frozen frosted cakes, and thaw overnight in the fridge. These are the cakes--and tortes--that memories are made of. Can't you just hear the "aahs" from family and friends when they see what you've baked for them? Before heating the oven, check to see how layer cake pans will fit on an oven rack. Some of our layer cake recipes use 3 round baking pans. Stagger the pans on the rack in the middle of the cold oven. Having 1 inch between pans and between the pans and the sides of the oven is ideal, and the oven door should close completely. What if 3 pans don't fit or you have only 2 layer pans? Just cover and refrigerate batter in the third pan or in the mixing bowl while first 2 layers are baking. If you have 2 pans, remove baked cakes from pans and cool one pan before baking the remaining batter. An extra minute or two for baking may be needed. Cooking spray can be used, but the cake may be less attractive with high sides and a lip. If using, spray it on only the bottom of the pan; do not dust with flour. Cool layer cakes in their pans on wire racks for 5 to 10 minutes. This keeps the cake from breaking apart, which it could if it's too warm and tender. Cooling a cake right side up on a cooling rack also is helpful. Turn the cake out of the pan onto a rack; top with another rack, then quickly turn the racks and cake so it cools right side up. 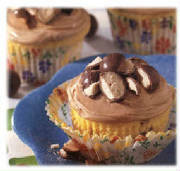 Make a batch of cupcakes from any of our cake recipes (for a layer cake or 13x9-inch cake) or cake mixes. You'll get about 24 to 36 cupcakes. Line medium muffin cups, 2 1/2x1 1/4 inches, with paper baking cups. Look for cups in festive colors and special designs at your supermarket, party store or paper warehouse. Fill each cup about half full with batter. Bake 20 to 25 minutes or until a toothpick inserted in the center comes out clean. With these cakes, you'll be so creative. And there's a cake idea for just about every occasion and holiday. You may think following these tips will take more time, but it'll be time well spent because frosting and decorating will be easier! Use the pan sizes called for because the sizes will affect how the cut pieces fit together. Get the cake good and cold before cutting the pieces. Refrigerate for at least 2 hours or overnight. 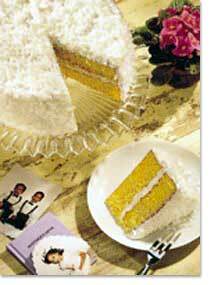 A cold cake is less tender so it's less crumbly. You may want to "crumb coat" the exposed cut edges before frosting to help control crumbling. To do this, mix water, a teaspoon at a time, into a small amount of frosting to make a thin frosting. Spread a smooth, thin layer onto cut surfaces; freeze about 30 minutes. Even if you decide not to "crumb coat" the cake pieces, they'll still be easier to handle if you freeze them on a cookie sheet for 30 minutes to an hour before frosting. Cover frosting with plastic wrap while using it to keep it from forming a crust and becoming dry. A pastry blender makes easy work of cutting the shortening into the flour. If you don't have one, use 2 knives: With the blades almost touching, move the knives back and forth in opposite directions in a parallel cutting motion. The side of a fork or a wire whisk works, too.Easy does it. If you mix too much once the water is added, the pastry will be tough. Make pastry ahead to make rolling it easier. After shaping pastry dough into a flattened round, wrap it tightly and refrigerate for at least 15 minutes or even overnight. This break lets the shortening solidify, the flour's gluten relax and the moisture absorb evenly. For a shiny top crust, brush the crust lightly with milk before baking. For a sugary top crust, moisten the crust lightly with water or milk, then sprinkle with a little sugar before baking. Shaping Pie Edged & Finishing the Top Crust To glaze a top crust, brush the crust lightly with beaten egg yolk that's been mixed with a little milk before baking. To glaze a top crust, brush the crust lightly with beaten egg yolk that's been mixed with a little milk before baking. It seems there's a variety of apple for nearly every letter of the alphabet, from Beacon (sweet and mealy) to York Imperial (slightly tart and crisp). Also look at the supermarket because some display information near the apples-- especially near locally grown varieties--explains whether the apple is best for baking, cooking or eating. 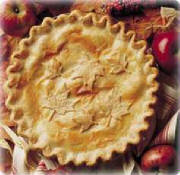 Some bakers mix apple varieties in a single pie, combining tart with sweet or crisp with mealy. This is a great way to personalize a recipe, but perfecting takes a bit of trial and error. Because apples shrink quite a bit during baking, a pie may have a gap between the apples and the crust. Using tart, firm apples helps, layering so there isn't too much space between them. Making larger holes in the top crust also helps. You can cut the baking time of an apple pie in half by using a microwavable pie plate. Microwave your unbaked pie uncovered on High 12 to 14 minutes or until the filling begins to bubble through the slits in the crust. Then transfer the pie to a conventional oven (don't preheat), and bake at 450°F for 12 to 18 minutes or until the crust is brown and flaky. When berries are plentiful, nothing's better than baking them in a pie. Although Betty's recipes nearly always give tips for using frozen fruit that's available year-round, using frozen fruit just isn't the same as coming home from the farmers' market or roadside stand with baskets of locally grown berries to fill a pastry you've made yourself. One difficulty that occurs when baking a pumpkin or sweet potato pie is that the crust rises up during baking. To prevent this, be sure to carefully ease the pastry circle you've rolled into the pie plate, then make sure no air is trapped between the pastry and plate. Also check that there's no hole or tear in the crust that will allow unbaked filling to soak through the crust and cause it to rise. If your baked pumpkin or sweet potato pie separates from the crust or develops a split in the center, it's a sign that the pie was baked too long or at too high a temperature. Test for doneness 1 inch from the edge using a knife; the knife should come out clean. Pies are baked at higher temperatures (375°F to 425°F) than cakes bake at, so the rich pastry dries and becomes flaky and golden brown and the filling cooks all the way through. To keep pie crust and pastry edges from getting too brown, you can shield them with aluminum foil. Remove the foil 15 minutes before baking is finished so the edges can brown. 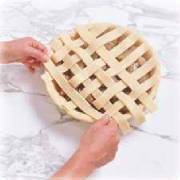 For an unfilled one-crust pie crust, always prick the pastry thoroughly with a fork before baking. The steam created in baking can escape through the holes so the crust won't puff up and leave no room to add the filling! For one-crust pies that bake the filling in the shell, such as pumpkin and pecan pies, don't prick the crust. If you do, the filling will seep under the crust during baking. Keep pies that contain eggs, such as pumpkin and cream pies, in the fridge. Otherwise, you can keep a fruit pie at room temperature for 2 days; after that, store it loosely covered in the fridge up to 2 days longer. In warm climates, always store fruit pies in the fridge. You can freeze either unbaked or baked pie crust. An unbaked crust will keep for 2 months in the freezer, a baked crust for 4 months. Don't thaw unbaked crusts; bake them right after taking them out of the freezer. To thaw a baked pie crust, unwrap and let stand at room temperature, or heat in the oven at 350°F for about 6 minutes. Tuck away a fruit pie by freezing for later! For best results, the pie should be baked first. Then put it, uncovered, in the freezer. When it's completely frozen, wrap the pie tightly or put it in a plastic freezer bag and pop it back in the freezer. Frozen baked fruit pies will keep up to 4 months. To serve a frozen 2-crust pie, unwrap it and thaw at room temperature for 1 hour. Then heat the pie in the oven at 375°F on the lowest rack for 35 to 40 minutes or until warm. If, however, you want to freeze pies unbaked, wrap and freeze the pie the same as a baked one. Don't cut slits in the top crust yet. Unbaked fruit pies will keep in the freezer up to 3 months. When you're ready to bake, unwrap and carefully cut slits in the still-frozen top crust. Do not thaw. Bake at 425°F for 15 minutes, then reduce the heat to 375°F and bake 30 to 45 minutes longer or until crust is golden brown and juice begins to bubble through the slits. Remember when you helped pick apples or raspberries or peaches, then watched as an aunt or a neighbor turned them into apple-raspberry crisp or peach cobbler? What a memory! 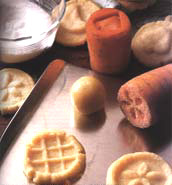 And what a great idea to carry on the tradition of baking these simply delicious desserts with your child. Look at the supermarket because some display information near the apples--especially near locally grown varieties--explains whether the apple is best for baking, cooking or eating. Peaches and plums are plentiful in summer, pears in late summer and through the fall. When berries are plentiful, nothing's better than baking them in a classic fruit dessert. Although Betty's recipes nearly always give tips for using frozen fruit that's available year-round, using frozen fruit just isn't the same as coming home from the farmers' market or roadside stand with baskets of locally grown berries to fill a pastry you've made yourself. You'll need a casserole dish, either heatproof glass or ceramic, for making crisps and cobblers. The secret to a biscuit topping that's cooked all the way through is having the fruit good and hot before adding the topping and then baking. Cobblers and crisps are best served the same day you make them. If you bake cheesecakes often, you'll benefit from using a springform pan. After the Cheesecake is BakedFirst, let the cheesecake cool at room temperature for 30 minutes or as directed in the recipe before you put it in the fridge. Second, refrigerate it uncovered for 2 to 3 hours or until chilled before you serve it. If you cover the warm cheesecake right away, moisture may condense and drip onto the cheesecake top. Third, after chilling, cover the cheesecake so that it doesn't dry out or pick up odors from other foods, and keep it in the fridge. For cheesecakes with side crusts, run a metal spatula along the side to loosen it from the pan; do this after baking and after refrigerating. Otherwise, the cheesecake could pull away from the crust as it cools. Pick a cool, dry day to make meringue. If it's humid or rainy, the sugar in the meringue will absorb moisture from the air and make the meringue sticky and spongy. The meringue also may get beads, or drops, of sugar syrup on the surface. Start with cold eggs, and separate them very carefully. Cold eggs are easier to separate! Even a speck of yolk in the whites will keep the whites from achieving the volume needed during beating. Spread the meringue over the hot pie filling right up to the crust so it "seals." When it's sealed, it won't shrink or weep or ooze liquid after baking. A meringue shell should be thoroughly dry and crisp after baking. If not baked long enough, it will become limp and gummy. Cool meringue shells in the oven-with the heat turned off-for as long as the recipe suggests. To keep them crisp, store tightly covered. Making cream puff dough starts on top of the stove. Heat water and butter to boiling, then stir in flour all at once. You need to keep stirring vigorously over low heat until the mixture leaves the side of the pan and forms a ball. This takes about a minute. This step cooks the flour, which is needed for cream puffs that "puff." Next, beat in eggs. The pastelike mixture that results should spoon out onto a cookie sheet without flattening. Steam is the "leavening" in cream puffs, which is the reason for using a higher baking temperature (400°F). The steam that "puffs" cream puffs is similar to the steam that "pops" popovers. Before serving cream puffs, cut them open and pull out any strands of soft dough. 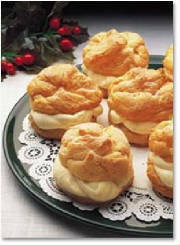 Yummy fillings for cream puffs include whipped cream, ice cream and puddings. Store filled cream puffs in the fridge, and serve within 2 hours of preparing. If stored longer, the cream puff shell gets soggy. Filled cream puffs don't freeze successfully. Unfilled cream puffs can be stored in the fridge for several days; you'll first want to cut them open and remove the strands of dough to prevent sogginess. To freeze unfilled cream puffs, wrap tightly in moistureproof wrap or resealable plastic food-storage bags, label and freeze up to 3 months. There's no need to cut cream puffs open or remove the strands of dough before freezing. Thaw at room temperature. Store in a dry, cool place between 60°F and 78°F. Wrapping chocolate in moisture-proof wrap is wise if the temperature is higher or the humidity is above 50 percent. Chocolate can be stored in the fridge; let it stand at room temperature before using. If your chocolate has a white, crusty-looking film on it, don't toss it out! This is called "bloom" and develops when the chocolate is exposed to varying temperatures, from hot to cold. This change in heat allows the cocoa butter to melt and rise to the surface of the chocolate. Chocolate must be melted carefully because it can burn easily. Never heat dark chocolate above 120°F or white or milk chocolate above 110°F. Be sure to break up or chop chocolate bars or squares before melting. To melt most types of chocolate, microwave uncovered in a microwavable dish or bowl on Medium (50%), stirring once every minute, just until melted. Some chocolate retains its shape when softened, so stir it frequently. Take care to never get water in chocolate while it's melting. If this happens, the chocolate will get thick, lumpy and sometimes grainy--it's called "seizing." You'll think it's ruined. Little specks of hardened chocolate can appear when you are stirring melted chocolate into other ingredients. To keep this from happening, melt the chocolate with the liquid or fat that is also called for in the recipe. If you use at least 1 tablespoon of liquid or fat to 2 ounces of chocolate, you will avoid the risk of the chocolate seizing. Also, never stir cooled melted chocolate into ice-cold ingredients because the cocoa butter will harden immediately. What's better than a blueberry muffin on Saturday morning? Or what's a nicer less-sweet snack than muffins for your kids after school? Plus making them is just about the easiest way to learn to bake! Use shiny muffin pans for golden and tender muffin crusts. For nicely shaped muffins with rounded tops and no "edges with ledges," most recipes have you grease only the bottoms of the muffin cups with shortening. For easy baking and easy cleanup, use paper baking cups. Measure with care. If you don't, a coarse or crumbly texture and dryness can be the result. The batter should be lumpy after you stir the dry ingredients into the wet ingredients. If you mix the batter too much, muffins can be tough with "peaked" tops and holes or tunnels inside. Take the guesswork out of filling muffin cups by using a spring-handled ice-cream scoop! Scoops marked with a No. 20 or 24 get most muffin cups about 3/4 full--the amount you need for the rounded tops you want. End up with empty cups in your pan? If you've greased them, fill the empty ones half full with water. It keeps the grease from burning and all the cups will bake more evenly. When muffins are done, take them out of the muffin pan immediately so they don't get soggy. If you need to, loosen them with a table knife, then lift them out. If a recipe has you leave the muffins in the pan for a few minutes after baking, those muffins are more fragile and need to be set up a bit so you can remove them easily. Muffins baked in paper cups should lift right out. Serve muffins while they're good and hot! Check that ingredients are fresh. Shortening or leavening that is out of date won't give you the best-tasting or highest-volume biscuits. Measure with care. If you don't, a coarse or crumbly texture and biscuits that don't rise can be the result. One secret is to properly combine, or "cut in," the right amount of shortening and flour. If there's not enough shortening to flour, the "cutting in" process won't set up the flaky layers as biscuits bake. A pastry blender works great for cutting in shortening. If you don't have one, you can crisscross 2 table knives through the flour and shortening or use a wire whisk. For nice-looking biscuits and even baking, roll or pat the dough without a lot of handling to an even thickness. Too much handling with too much flour gives you biscuits that are tough and dry. If you make a lot of biscuits, here's a clever trick: Use 2 sticks, 1/2 inch thick and 14 inches long, to get the same thickness every time. Place the ball of dough between the sticks, and roll or pat the dough to the thickness of the sticks. Use a biscuit cutter dipped in flour to cut the dough, pushing the cutter straight down through the dough. If you twist as you cut, the biscuits will be uneven. Cut the biscuits as close together as possible. After cutting the first round of biscuits, lightly press-not knead-the scraps of dough together. These biscuits will look slightly uneven. Who doesn't let a couple of bananas get a little ripe or have half a bag of cranberries just waiting in the freezer? Turning those "leftovers" into fragrant quick bread loaves is the easiest and most soul-soothing solution we can suggest. Choose a pan that's the right size. For loaves with a gently rounded top and no "lipping" at the edges, grease only the bottoms of the loaf pans. Chop or shred fruits, vegetables or nuts before you start making the batter. If you start the batter and then stop to chop, the batter may get too stiff. And hold back on using up extra amounts of fruits or vegetables; the extras can make a loaf heavy and hard to bake all the way through. It's easy to mix quick breads by hand. Most recipes have no need for an electric mixer. It's okay if the top of the loaf has a large, lengthwise crack. 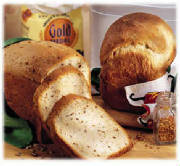 Cool quick breads completely before slicing; cutting while warm is one of the chief reasons for crumbling. Even better, store them tightly covered for 24 hours for easier cutting. Cut with a sharp, thin-bladed knife, using a light sawing motion. Read your bread machine manual carefully, especially the tips and hints. Make sure the machine is assembled correctly. Add ingredients in the order specified by the manufacturer. Carefully measure ingredients with standard measuring cups and spoons. Even little variations can dramatically affect the finished loaf. Ingredients should be at room temp, except for those normally stored in the fridge such as milk, sour cream and eggs. For high-volume loaves, use bread flour. Be careful when you peek! Checking the progress of your bread is tempting, but peek only during mixing and kneading. If you open the machine during rising or baking, the loaf can collapse. When using the delay cycle, be sure the yeast doesn't come in contact with liquid or wet ingredients. Don't use the delay cycle with recipes that contain eggs, fresh dairy products (butter and margarine can be used), honey, meats or fresh fruits and vegetables because bacteria can grow while these ingredients stand in the bread machine for several hours. If you get the urge to experiment by changing the ingredients, make just one change at a time so you can clearly see the result. For consistent results, keep your bread machine in the same place, away from drafts and areas of your house where heat and humidity fluctuate widely. Keep the area around your bread machine open for good ventilation. Batter breads are shortcut yeast breads made by mixing-but not kneading-a soft yeast dough. The texture is coarser than for breads that are kneaded and spread in a pan to give them shape and let rise. Most of Betty's recipes follow the "quick-mix" method, meaning the yeast is mixed with part of the flour, then very warm liquid (120°F to 130°F) is beaten in. One way to knead is by hand-the traditional way. Or use a standard countertop electric mixer with a dough-hook attachment. Bread loaves may have slightly less volume than those kneaded by hand. Grease a large bowl-bread dough will double in size-with shortening or cooking spray. Add the dough, turning it so all sides are greased. Cover the bowl with plastic wrap and set in a warm, draft-free place. Or place the covered bowl on a wire rack over a bowl of hot water. For a shiny crust, brush the top of the bread with an egg or egg white beaten with a little water. If desired, sprinkle with poppy, caraway or sesame seed or rolled oats. For a softer, deep golden brown crust, brush with softened butter or margarine. For a crisp crust, brush or spray lightly with water. For a soft, tender crust, brush with milk. Adjust the racks before heating the oven. If baking in pans, stagger the pans so they don't touch the oven sides or each other, and use a lower rack so the top of each pan is level with or slightly above the middle of the oven. If baking on a cookie sheet or in a muffin pan, place the sheet or pan on a rack in the center of the oven. How can you tell if bread is done? Tap the crust. If the loaf sounds hollow, it's done. 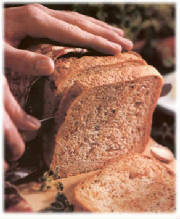 Place loaf on a cutting board or other surface suitable for cutting. Slice with a serrated bread knife or an electric knife. If bread is very fresh or still warm, turn it on its side to avoid squashing the top. Try new shapes. Cut round loaves into wedges. Cut slices into fingers, or cross-cut slices into triangles. Cut slices into fun shapes with cookie cutters.